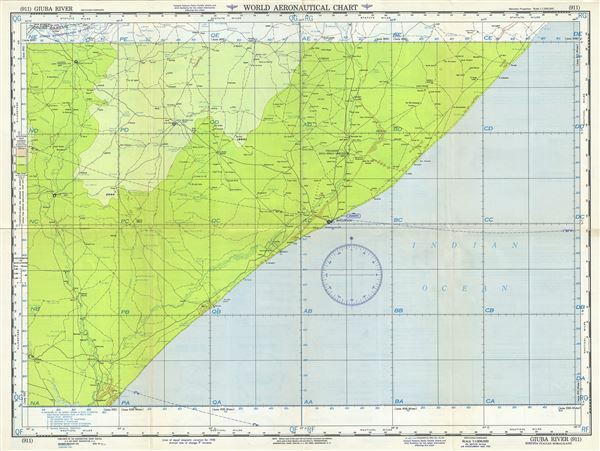 This is a scarce 1954 U.S. Air Force aeronautical chart or map of southern Somalia. It covers from Margherita north past Mogadishu to El Dere and inland as far as Afmadow. The chart notes towns, roads, cities, rivers, topography and other data essential to the air pilot. Verso features legends and a world aeronautical chart index. This chart was published by the Aeronautical Chart Service, and issued as chart no. 911. First issued in 1947, this is the fifth edition revised to Mar 1954.